Blood is the main fluid responsible for circulating nutrients, respiratory gases, minerals, and metabolic wastes. 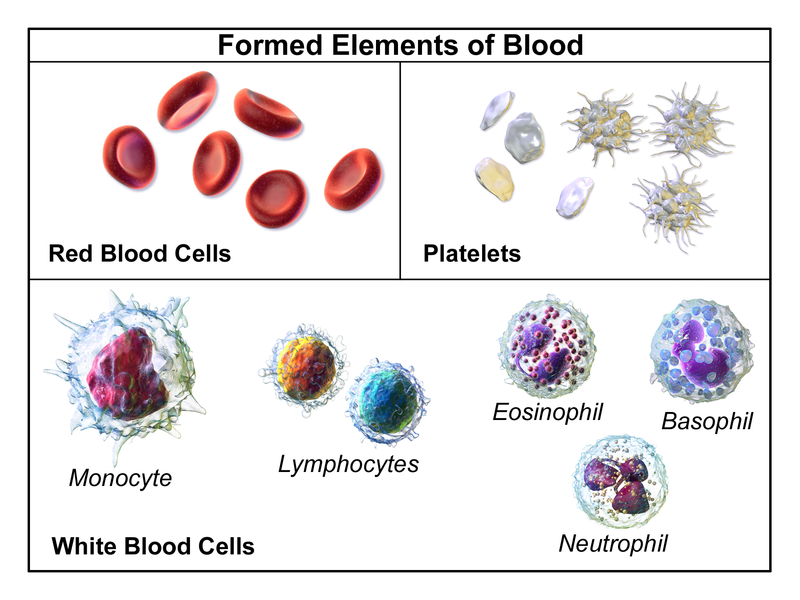 Red blood cells, white blood cells, platelets, and plasma are the components of blood. The main difference between blood and plasma is that blood is the main circulating fluid in the animal body whereas plasma is a component of blood. Plasma comprises water, glucose, amino acids, proteins, hormones, vitamins, minerals, antibodies, and dissolved carbon dioxide. Blood has a color, which is given by its respiratory pigment. On the other hand, plasma is a straw color fluid. Both blood and plasma perform immune functions by fighting against pathogens. Blood is a liquid that circulates through the arteries, veins, and capillaries of animals, transporting nutrients, respiratory gases, and metabolic wastes to their target organs. Adult males carry 12 pints of blood while adult females carry 9 pints. A, B, AB, and O are the four blood groups. Blood is divided into two categories based on the Rhesus factor; Rh positive and RH negative. The four components of blood are red blood cells, white blood cells, platelets, and plasma. Red blood cells transport oxygen from lungs to the cells of the body. Neutrophils, eosinophils, basophils, T cells, and B cells are the type of white blood cells, which fight against pathogens in the circulation as well as inside the tissues. Platelets are important for blood clotting. The cellular component of the blood is 45% of the total blood, and 55% of it is the plasma. Plasma is described below. Plasma is a watery fluid of blood in which the blood cells are suspended. When isolated, plasma is a straw color liquid. Plasma contains water, glucose, amino acids, proteins, hormones, vitamins, minerals, antibodies, and dissolved carbon dioxide. Since plasma comprises 90% of water, it is the main transporting medium of blood. 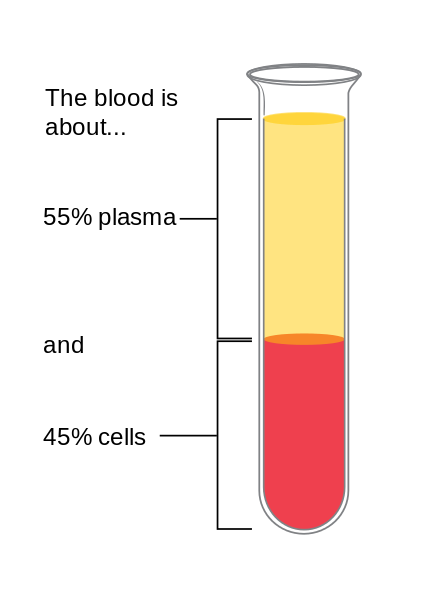 Plasma can be separated from its cellular component through centrifugation. The components of blood are shown in figure 2. Plasma carries out various functions in the body other than the transportation of blood components. It serves as the protein reserve of the body. Plasma also protects the body from pathogens. Moreover, it maintains the electrolyte balance and the pH balance of the body as well. Both blood and plasma are circulating fluids. Both blood and plasma transport necessary compounds by the body. Both blood and plasma perform an immune function in the body. Both blood and plasma contain clotting factors. Blood: Blood is a liquid that circulates through arteries, veins, and capillaries of animals, transporting nutrients, respiratory gases, and metabolic wastes to their target organs. Plasma: Plasma is a watery fluid of blood in which the blood cells are suspended. Blood: Blood is the main circulatory fluid in the body. Plasma: Plasma is a component of blood. Blood: Blood is composed of red blood cells, white blood cells, platelets, and plasma. Plasma: Plasma comprises water, glucose, amino acids, proteins, hormones, vitamins, minerals, antibodies, and dissolved carbon dioxide. Blood: Blood contains red blood cells and white blood cells. Plasma: Plasma lacks a cellular component. Blood: Blood is red color in vertebrates. Plasma: Plasma is straw color. Blood: Blood circulates nutrients, respiratory gases, and metabolic wastes to their target organs. Plasma: Plasma circulates water, glucose, amino acids, proteins, hormones, vitamins, minerals, antibodies, and carbon dioxide. Blood: Blood becomes solid and clotted after an injury. Plasma: Plasma turns into the serum after clotting. Blood: Whole blood can be donated. Plasma: Plasma can be donated after removing the cellular component of the whole blood. Blood: Blood transfusion may lead to incompatibility risk. Plasma: Plasma transfusion has no incompatibility risk. Blood is the main circulatory fluid of the animal body and plasma is the major component of blood. This is the main difference between blood and plasma. Red blood cells, white blood cells, and platelets are the cellular component of blood. Plasma contains dissolved nutrients, minerals, vitamins, hormones, and metabolic wastes. Both blood and plasma perform transport and immune function in the body. 1.“What is blood?” BloodSource, Inc., Available here. 2.Menger, Arjan. “What is Plasma?” Donating Plasma, Available here.